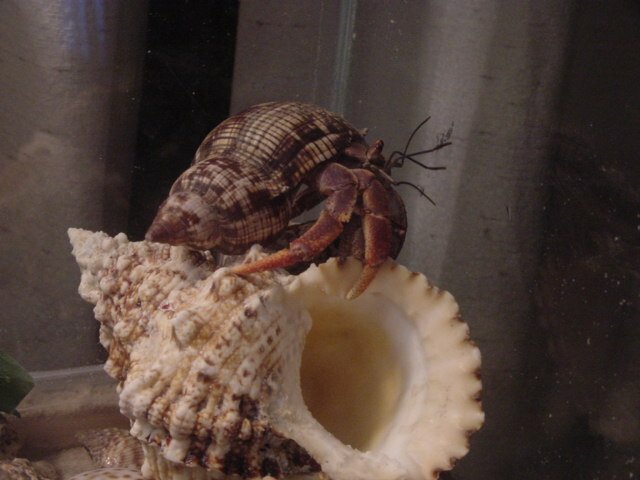 For the most part hermit crabs are very gentle. I have heard of some that are a bit on the aggressive side, but usually it comes from previous treatment from previous caretakers. Smaller crabs tend to be more commonly known for using their pinchers to hang onto things. If you are going to handle a hermit crab be sure to hold your hand out flat so they can not grab hold of your skin, and make sure that you are fairly still, so as not to scare them. As you spend more time with your crabs, they will get to know you and feel more secure when you handle them. Larger crabs tend to be more calm and relaxed, however I have heard of some to be capable of breaking a pencil in their big feeder claw when made angry. This usually takes a bit of effort to get them to do, and it is not recommended that you get them use to breaking pencils, so be forewarned. They have a good grip. Just be sure you get to know your crabs and watch out if they are new. As time goes by you will get to know each other better and you will know what the boundaries are for your friend. My crab Seems mean. It pinches a lot. What can I do? I know of some owners of Larger, or jumbo crabs who tend to let their crabs roam on the floor under supervision rather than being held, mainly due to their size. If you are uncomfortable holding your crab, this may be the best route for you to take as well, and in time you may find yourself trusting one another well enough to make the attempt to handle them without being afraid. Another suggestion would be to use a rag of some sort while holding them at first. This way if they do grab anything it will be the material instead of your hand. I have had a few pinchy crabs that after holding with the rag for a while, they have relaxed and learned to trust me when I hold them. Mostly the pinching was due to feeling insecure, but now things are different.